Perhaps the most serious challenge currently faced by society is the conflict between global food security and environmental sustainability. Globally, about 840 million people are chronically hungry, (FAO, 2013), 2 billion suffer micronutrient deficiencies (Tulchinsky, 2010), and 1.9 billion are overweight or obese (WHO, 2014). The FAO projects that failure to increase global food production by 70% by mid-century in response to population growth and rising affluence will have unacceptable humanitarian and social costs (FAO, 2011). Undernutrition is a factor in nearly half of all deaths of children under five (UNICEF) and those who survive may be developmentally impaired. Food shortages also contribute to political unrest. For instance, in 2008, climate change induced droughts and rising food prices led to food riots in dozens of countries around the world (Homer-Dixon et al. 2015; Berazneva & Lee, 2013). Kelley et al. (2015) connect climate change, fresh water use, and crop failure to the current Syrian civil war. systems. Food production now covers almost 40% of the global land surface (World Bank, 2016), and the marginal ecological costs of converting even more land to agriculture are almost certainly rising. Agriculture is also a major threat to the remaining planetary boundaries, especially chemical pollution and climate change. The food system currently contributes 30% of global GHG emissions (Garnett, 2011). Among the expected ecological costs of exceeding these boundaries are the degradation and loss of ecosystem services essential to agriculture (eg. Davidson, et al., 2006; Altieri et al., 2015, Craine et al., 2010). 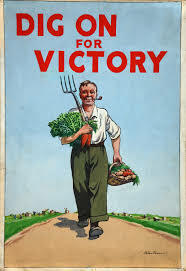 During both World War I and World War II the United States stepped up to the plate with ‘Victory Gardens’. Our research shows that a similar effort, and some diet modification can reduce GHG emissions by over 80% in the food system, while having a great impact on other planetary boundaries as well, drastically reducing land use, for instance. The question we have looking toward the future is rather than ‘how can we increase economic activity forever’, how about ‘how can we make sure that everyone has an extra 5 hours a week to spend in the garden?’ That’s what it will take to save the world? Doesn’t sound too bad, does it.